Experimental studies suggest that phytoestrogen intake alters cancer and cardiovascular risk. This study investigated the associations of urinary phytoestrogens with total cancer (n = 79), cardiovascular (n = 108), and all-cause (n = 290) mortality among 5179 participants in the continuous National Health and Nutrition Examination Survey (1999–2004). Urinary phytoestrogens were measured using high-performance liquid chromatography with tandem mass spectrometric detection. Survival analysis was performed to evaluate hazard ratios (HRs) and 95 % confidence intervals (CIs) for each of the three outcomes in relation to urinary phytoestrogens. 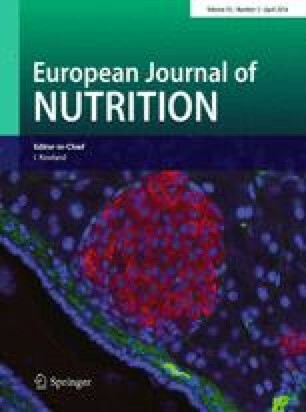 After adjustment for confounders, higher urinary concentrations of total enterolignans were associated with a reduced risk of death from cardiovascular disease (HR for tertile 3 vs. tertile 1 0.48; 95 % CI 0.24, 0.97), whereas higher urinary concentrations of total isoflavones (HR for tertile 3 vs. tertile 1 2.14; 95 % CI 1.03, 4.47) and daidzein (HR for tertile 3 vs. tertile 1 2.05; 95 % CI 1.02, 4.11) were associated with an increased risk. A reduction in all-cause mortality was observed for elevated urinary concentrations of total enterolignans (HR for tertile 3 vs. tertile 1 0.65; 95 % CI 0.43, 0.96) and enterolactone (HR for tertile 3 vs. tertile 1 0.65; 95 % CI 0.44, 0.97). Some urinary phytoestrogens were associated with cardiovascular and all-cause mortality in a representative sample of the US population. This is one of the first studies that used urinary phytoestrogens as biomarkers of their dietary intake to evaluate the effect of these bioactive compounds on the risk of death from cancer and cardiovascular disease. There was no specific funding for reported research. The de-identified data analyzed in the present study are freely available in public domains, and the approval for such data analysis by the Institutional Review Board of Indiana University was sought but determined not to be applicable.